This might be remembered as a story I shared a long while back. It was one of the ones lost when I shut down the old site. The twang of the fishing line broke through the silence of the early morning air. The moon a memory but the sun had not yet broken over the horizon. Sturdy hands held the fishing pole in check. But they did not reel in the line. The dock had been his fishing spot since he was a small boy. Him and Jake, they met here at least every other week for as long as he could remember. Sometimes Jake would bring the bait and the beer, other times he would. It had become their tradition, their ritual. This time of morning was the perfect time. The bugs were just coming out on the surface, the fish just waking up and looking for breakfast. He gave the line a tug, but felt no resistance. He reeled in the hook and placed a new worm on it. Before sending it out again, he pulled a can from the cooler and cracked it open. “You want one?” He set it on the table beside him and pulled out another and cracked it open as well. After a quick pull from the can he set it down and cast his line deep into the lake. The chase was on. He reeled the line back to the dock, hoping to draw in a few bites. He stopped when the bobber was still 10 feet away. The bobber popped under the water then came back up again. He pulled back on the fishing rod, a quick jig of the bait. Another hit, the bobber went under again. A mosquito bit at his ear, but he ignored it. The game was on and he focused on his prize. Another hit, he pulled back on the rod and turned the reel. There was resistance in the line. He had it. He began to reel it in. The fight didn’t change, give a little take a little. Patience wore your opponent down. The fish on the other end seemed to know the game as well. It put up a fight then changed direction. Then put up a fight again. It sought to break free, testing the line that had hooked into it. After setting the beer on the table he focused on the fight again. It was only a few minutes more and he readied the net to bring it out of the water. It flipped into the air, its way of telling him he hadn’t won yet. Are you ready for October? Just a couple days away and we will be in a blast of stories all month long. The theme is Letters from the Sanitarium, can you picture what that might be? I hope you enjoy stories like this and even the crazier stories that happen on this site. Please consider subscribing to the site through Patreon. Your monthly subscription will go a long way to help me keep improving the site and bringing more great stories to you. 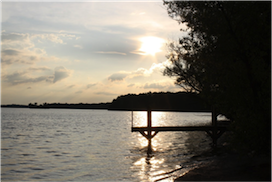 13 Responses to "The Ol’ Dock"
Sometimes I uncover a sappy story or two. This is my attempt to soften you up before the start of October. It’s going to be an interesting month. Keeping ya on your toes. Get ready October is here, and its gonna get freaky. Aw this was sad, but sweet. Well done. Thanks. Sometimes I find my sentimental side. Aww that was a lovely story Jon! Thanks, those exist some where in the back of my mind. I really like this one, Jon. I’m an angler myself (Although nowadays a fair weather one) so I can relate to the emotional attachment to a particular venue, and I would think many an angler would be happy to know their final resting place was one that held so many happy memories. our favorite spots and favorite hobbies hold a strong emotional appeal. Probably one of the greatest things we can do for our dead is to celebrate them with what they enjoyed most.